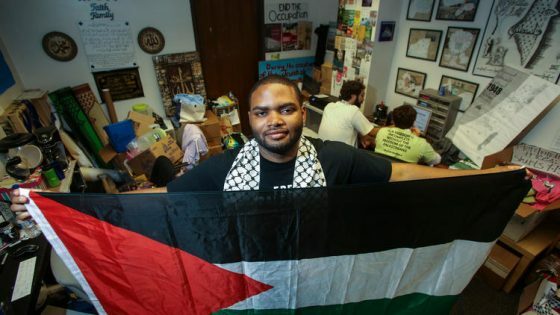 As the second half of the academic year approaches, student groups across the country that advocate for Palestine will begin to prepare for campaigns on their respective campuses. Students for Justice at Palestine (SJP) San Jose State University (SJSU) has already ran a divestment campaign successfully. November 18th the students at SJSU made history by becoming the first student government in the California State University system to pass divestment. SJP SJSU’s campaign specifically targeted companies that the university had financial relationships with including Hewlett Packard, G4S, Motorola solutions, and Caterpillar. The Tower Foundation, which is responsible for SJSU’s funds and investments, is writing a resolution on divestment, which will be voted on by the Board of Directors on December 15th. Jana Kadah, the outreach coordinator for SJP at SJSU emphasized the importance of education as the first step in passing divestment. “Educating our peers about the international crimes committed on the Palestinians is the first step to getting support with divestment. The biggest problem is that people just don’t know the truth about Palestine and what has happened and continues to happen to the people. We can’t garner support for a cause people don’t understand. When people learn the truth, most are more than willing to show solidarity in any way they can and support a peaceful means of protesting these crimes. Divestment from companies that profit off of the human rights violations is one of those peaceful means,” Kadah said in an email to Palestine in America (PiA). Kadah also spoke about how important it is to get other groups on board with the campaign. SJSU’s divestment campaign had 28 on and off campus groups on board, including the Black Student Union, Anakbayan, MEChA (Movimiento Estudiantil [email protected] De Aztlan), Student Advocates for Higher Education, Sikh student Association, Muslim Student Association, Jewish Voices for Peace. Because many of the companies the school would divestment from have a history of committing crimes against other oppressed people, it made it easier to garner support, according to Kadah. “G4S is responsible for aiding armed forces in the Philippines that are responsible for oppressing and killing a lot of people. G4S profiting off of human rights violations towards our people is something SJP and Anakbayan unfortunately had in common but that helped us sympathize and unite and take action with each other,” Kadah said. Kadah stated that having other groups supporting divestment was also important because when debating divestment they had multiple student, faculty, and community speakers, while most of the anti-divestment sentiments came from one club on campus and off-campus groups like Hillel or StandWithUs.